Have to admit that I initially misread this weeks assignment for Sally's Focus on Life series by concentrating solely on the phrase, "outside of the box". Thought I was being so creative and meaningful collecting images of things that were FROM the heart. And then I reread the assignment last night. Eek - she said look for "literal" hearts! P.S. I'm SO enjoying this challenging series. Thanks Sally! Great heart and it is outside the bix. Beautiful find and photo! Now the candlestick will have an extra special aspect to it. I love that you had to turn it over, a change in perspective, to capture the heart! Like you I am loving this challenge this year, it is just what my soul needed! I'm not sure I captured what I was supposed to capture either this week Lori, but either way - your photo and that heart are super!! And, just FYI - I mentioned you and your blog on my other post for today as I played along with Tracy Statlers Wellness Words Jewelry challenge today and want to thank you for having a refreshing blog and great tutorials and wonderful links! Well, you pulled it off on short notice! Lovely! this was a fun prompt! normally I would not see a heart looking at your picture, but this prompt is making me look at things twice and see a different angle - what fun! Very cool heart. I kind of adore metalwork hearts all of a sudden! It has been grey and dark here for weeks...not really conducive to good photos. Fantastic photos, Lori! I love the upside down one! I was focusing on outside the box too. It wasn't until I stopped looking that I started seeing them. Think you got it right! Lovely photos for short notice! 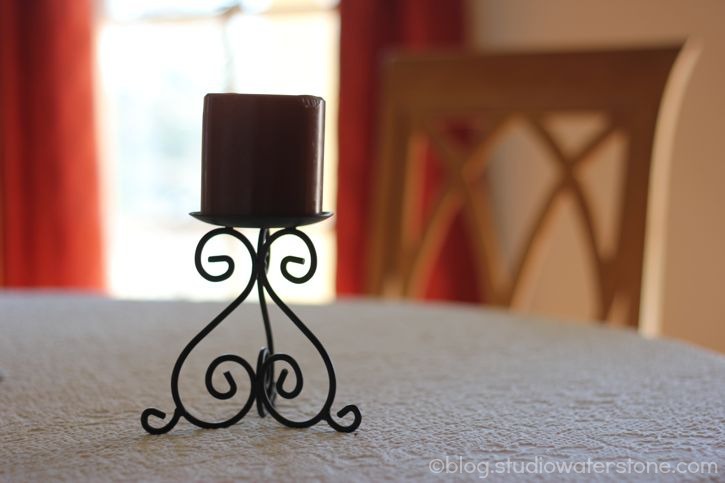 Fabulous metal scroll candle holder - I love metal (have I said that before?) Out of the box is what I focused on too but then, some of us like to make it hard on ourselves! 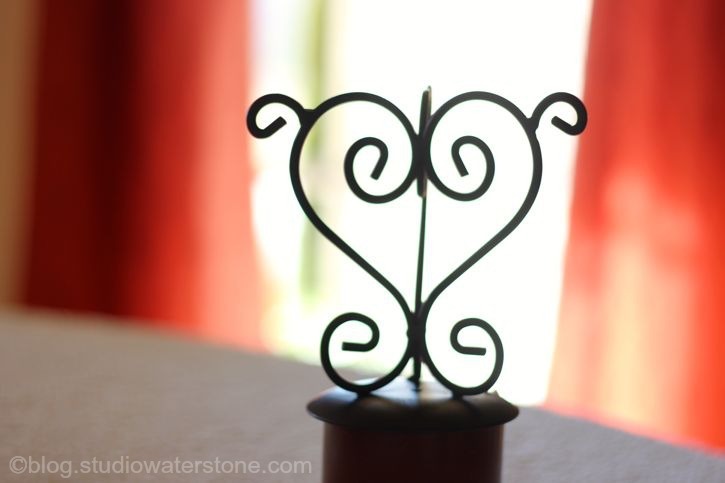 I wish my wrought iron scrolls formed hearts - they don't! Nice save! I don't think you can get an assignment 'wrong' with this series. From the heart would have worked too, I think (my post was a bit of both). But it is fun to see where literal hearts do pop up in our everyday lives! There is no wrong way to bring your thoughts a photos to this hop. Great job. Nothing like panic to really open up our eyes!! Great shot!! I think you nailed it! Beautiful shot.